Some assume energy is intelligent. Energy follows commands, it is set in motion. One must ask if energy were intelligent why would there be disease? Why does your heart beat? It beats because there is an interaction, that produces a signal that commands it to. Energy follows commands, most of the commands are commands that come from the brain, the genetic programming, the subconscious mind, beliefs, emotions, and social pressures. As I prepare to start a new Tai Yi class, my focus has been to continue Hossca’s work, building upon his original intent. Life Energy Flow Tai Yi School of Healing started in 1995. The first statement Hossca made, in his first class, effectively sums up his purpose as a teacher. It is important to understand how energy works so that you can learn to work with energy rather than against it. Human consciousness and human experience are complex. Much of what is taught to the general public is oversimplified, has a mixed intent, and is blended with religious concepts. In my years of learning, I have witnessed Hossca pick apart the hidden conflicts many false notions carry and the issues they create. I have often heard him state, if you were going to become an apprentice electrician, the first lesson you should learn is to respect electricity. If you do not respect the power of energy, energy will not respect you. A simple example here is the universal force we call gravity. Most humans learn quite young to respect gravity and its power. As humans age occasionally they will use their body out of harmony with this force and quickly be reminded why they need to respect it. As with many aspects of energy in life, it is what it is. You can’t sit and bargain with gravity. You can meditate and attempt to convince yourself it will not affect you. Perhaps you can convince yourself that some other energy will protect you from its effects. However, when one can understand how energy works, they can use their energy effectively to flow in harmony with their environment. The beauty of gravity is that it is an instantaneous teacher. It is through this instant feedback that humans have come to respect gravity. When one falls, they do not blame gravity. Usually, they blame something or someone else in their environment, which is a different matter entirely. It is easy to respect energy that provides instantaneous feedback such as gravity, electricity, and extreme heat. However, when the feedback is delayed, it is easy to forget to respect energy. How many people each year expose themselves to intense sunlight for an extended period, and then later feel the pain of not respecting the sun? This mechanism is easy to see and understand, yet easy to forget. The cycles and function of life energy are what they are. The sun is not open to negotiation. One can learn to flow with energy avoiding a negative consequence. One can try to resist and get burned. In some cases one can use wisdom, harnessing other energies to counterbalance the situation. However, just as with products sold to protect the skin from the sun, there are many options available that are advertised as helpful but are toxic and create a secondary set of problems. Wisdom and understanding must be used. Life Energy Flow Tai Yi School of Healing will cover many aspects and mechanisms of the human experience that are not well understood, that provide delayed feedback yet can have powerful consequences. The focus of the school is to teach students to understand cycles and patterns of energy. Let’s use the example of thought. Thought has power, yet the feedback cycle of thought can have a very delayed reaction. A single thought can set in motion a chain of events, that minutes, hours, days, or even years later can culminate into a painful experience. The human experience is a complex interconnected web of energy. As one begins to understand and respect the different aspects of energy that they encounter and create with, this knowledge offers the opportunity to use greater wisdom. However just as working with the energy of the sun that requires not only awareness but also voluntary choice, which is something each must take responsibility for within their own life. It is our goal to build and emphasize the importance of understanding how energy works so that students can effectively use their energy in their life, and grow to assist other people. The new Basic Tai Yi class will be an open format. 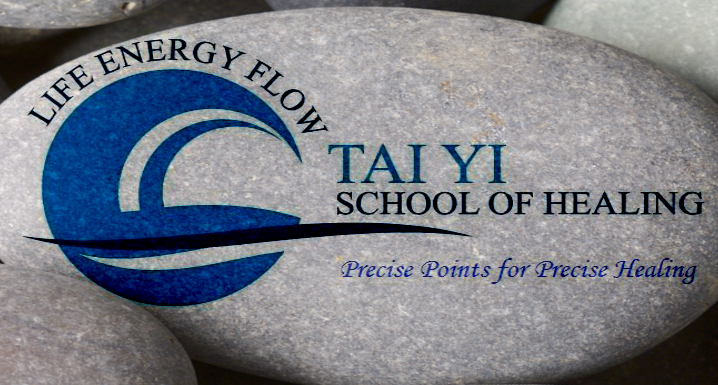 We will explore how energy works on a variety of levels, and focus on training individuals to begin to feel energy, and use energy properly so that one can develop their ability to practice Tai Yi. These classes will consist of two aspects. The first is building a knowledge base in the philosophy and principles of Tai Yi. The primary focus in this part is understanding how energy works, and human consciousness. The second aspect will consist of training for the practical application of Tai Yi, training to be an effective practitioner. This will consist of hands on demonstrations and exercises. Students will receive hands on training by Joseph Armeanio and Jason Harrison. If you desire to be a student in the new Basic Tai Yi classes starting in August, please email Joseph Armeanio at Taiyipoh@aol.com, or Hossca at Hossca@Jonahlifeinstitute.com. Each Tai Yi treatment uses a Grid System. The Grid System is a series of gentle pressure points (one pound of pressure) on the body. Each point that is “set” corresponds to a point on a meridian. Each series of points in a treatment works with establishing a certain movement of energy for a desired outcome. The Grid system is a part of what makes Tai Yi unique. Most hands on energy modalities are not specific in where energy is sent into the body or bodies. Often ones are taught that energy is “intelligent” and just knows where to go and what to do. If energy naturally carried healing intelligence there would never be an imbalance of life energy within body. The brain and the mind can carry and send many different frequencies of energy to create disruption, dis-ease throughout the bodies. These energies are not intelligent energies for healing. Energy does carry intelligence, this is simply understood by looking at the laws of physics, however not all energy carries “healing intelligence”. The Grid System directs the healing intelligence of each exercise. The Grid System establishes this order and how energy, will move within the meridian system. Many modalities do not respect the transfence of energy. There are generally two aspects to the Grid System. The first is the actual Grid. Each Grid carries a certain number of points, which are to be “set” in a certain order. Setting this Grid works with preparing these points to accept energy, thus setting into motion how the energy will move within the maze of meridians and gates. The second aspect of the Grid System is the numerical order, length of time, and method of sending energy into these points established when the Grid was set. This second aspect is equally as important in creating the movement of energy desired in each treatment. Advanced students are tested regularly to accurately set points in the proper order, send energy into the points in the correct order, for the proper length of time, and to apply the proper method of energy that a particular treatment requires. Many forms of energy work are overly simplistic. You can call yourself a master in a single weekend or two. Most healers are not taught about healing energy, they assume the energy they are going to send is a healing energy. One must learn to send Universal Energy, not personal energy. What if you were in an accident, taken to the hospital, and then were told you needed a blood transfusion. Would you expect pure blood or blood polluted with different viruses? This is not greatly different than receiving energy. Universal Energy is clear unpolluted energy that allows all meridians and gates (points that connect the meridians) to perfectly balance the bodies. Each exercise has its own unique grid system that is created on the body, to allow pure Universal Energy to flow directly into the area, issue, and core of mental, emotional, spiritual, or physical pain. It is your right to expect pure energy, it is also your right to allow Universal Energy to flow and allow healing to occur. I teach all my students how to send Universal Energy. They are continually tested on sending Universal Energy. This is a requirement for each student to advance to the Advanced Studies of Tai Yi. Would you want or allow the practitioner to send their own energy into you? What if the practitioner was depressed, angry, or carried some form of illness? Would you want that energy flowing into you? Not only would a healing not occur, you may walk away feeling much worse, even days or weeks later. Many do not think about this because people are not taught what energy is and how it works. Never assume all energy heals. Cancer is energy, diabetes is energy, depression is energy, and yes, a painful relationship is energy.